There is an old idiom "pull out all the stops," which references the use of all the resources or force at one's disposal in order do everything they possibly can to make something happen in the way that they want it to, and a look at some of the news we are seeing this past week, shows us that the media, big tech and liberals (Yes, I know they are all the same thing) are doing exactly that ahead of the midterm elections in order to manipulate the outcome. 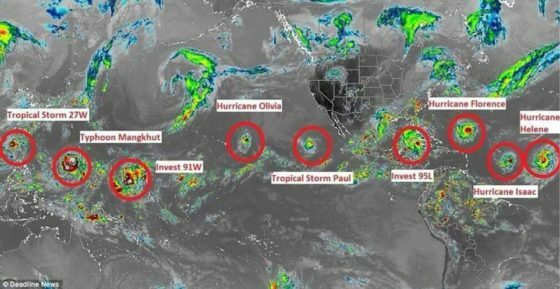 A number of seemingly unrelated events are occurring simultaneously which when one takes a step back and looks at them all as a whole, rather than separate occurrences, indicates something huge is coming as we near the midterm elections. Since that article, we have noted another strange form of protest by an unhinged, deranged Las Vegas, liberal professor who thought that shooting himself on school property was a good way to protest President Trump. 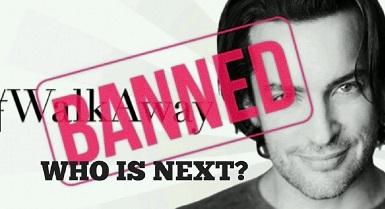 Big Tech Censors #WalkAway Founder: As many know by now there is a new movement that has become huge after a gay hairdresser from New York, Brandon Straka, created a viral video explaining why, after voting for Barack Obama, twice, he walked away from the Democratic party. Thousands started using the #WalkAway hashtag on Twitter to tell their stories of when they too felt the need to #WalkAway from the Democratic and why. The media then went into full damage-control mode and started claiming that "Russian bots" were behind the #WalkAway campaign and hashtag. Then Americans started using video to explain that 1) They are not Russian bots, and; 2) Why they needed to #WalkAway. Powerful testimonials, citing liberal media bias, the violence being perpetrated by the left against MAGA supporters and conservatives, lies they had been told and only discovered them after they started to research on their own and stopped trusting the liberal establishment media. The movement exploded online and offline and the founder, Brandon Straka decided to organize a #WalkAway March for October, and has been working towards that goal for weeks. 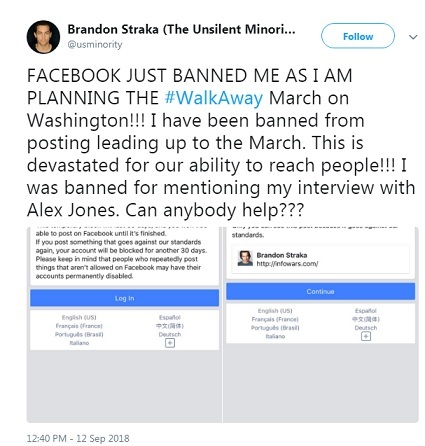 Straka said the suspension comes ahead of his planned march on Washington, D.C. and cuts him off from over 180,000 members of his #WalkAway campaign (the #WalkAway Facebook group has just over 76,000 likes). “I’m devastated right now. WalkAway Campaign is a grassroots movement. We don’t have corporate sponsors. We don’t have backers. We are raising the money and the awareness for our event ourselves. We use GoFundMe to raise money. And today Facebook took away my ability to communicate with the 180,000 members of the campaign leading up to the March,” Straka told right-wing outlet the Gateway Pundit. “This is going to smash my ability to provide information, answer questions, raise money, and rally with my people,” he continued. Note: One does not have to agree with Alex Jones to be disturbed by the coordinated censorship and the deliberate attempts to limit his online visibility, because big tech disagrees with his messaging and his opinion. The banning of Straka for nothing more than promoting his own interview regarding his #WalkAway movement is even more blatant as big tech attempts to prevent more Democrats from awakening to his message and perhaps deciding to #WalkAway themselves. 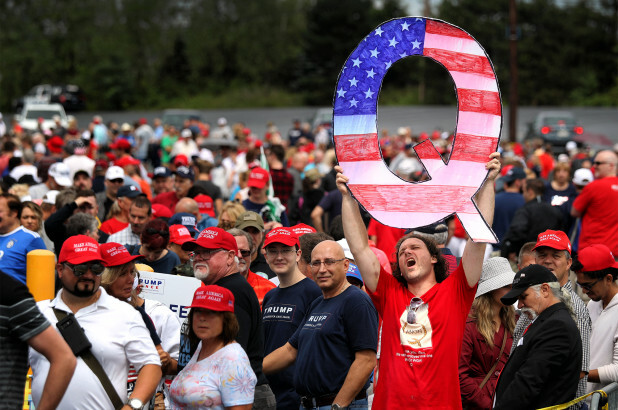 Reddit Joins Big Tech In Censoring: In another act of blatant censorship, from an unexpected source and unrelated to Straka and the #WalkAway movement, we see a number of coordinated media reports about Reddit banning a QAnon subreddit. Disclaimier: While we at ANP do not report on the mysterious Q messages, we do watch, observe and research them as we do everything else, and whether the unknown person is what they call a "LARP" (Live action role-player) or someone really in the know, is of no consequence to the main point. The point is censorship, preventing a large number of people, and this Q-person has a huge following, even if many do not subscribe to the belief that he/she is anything more than someone pretending to be "in the know." When dozens of liberal establishment media outlets coordinate to report on the same story, all within hours of each other, there is always something afoot. 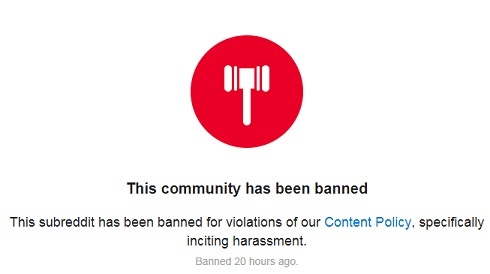 Now when you click any one of those subreddits, the message on the screen states "This community has been banned," and as of this writing, they all say "Banned 20 hours ago," meaning they did a sweeping ban, (censored) all subreddits at the same time, for supposedly violating their content policy. Just as I said about the coordinated ban against Alex Jones and InfoWars, one does not have to agree with them, nor believe in all their theories or messaging, to be abhorred by the blanket ban of discussion on any topic or person that others wish to discuss online. 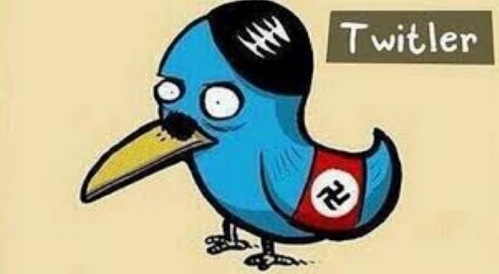 Twitter Declares Legal Term 'Illegal Alien' To Be 'Hateful Content: The definition of "illegal alien" is "a foreigner who has entered or resides in a country unlawfully or without the country's authorization. The DHS definition of terms also defines the word "alien" as "Any person not a citizen or national of the United States." It appears Twitter doesn't care about proper terminology, nor legal terminology, as the Center of Immigration Studies has now been blocked from promoting any post that includes the term "illegal alien," as described in a recent set of tweets explaining Twitter's censoring of their posts. Via their Twitter account on September 11, 2018: "1/ Twitter is not allowing us to promote any tweets including the phrase "illegal alien(s)", citing it as Hateful Content. However, the phrase "illegal aliens" has been used in both federal law and by the Supreme Court." "2/ From Arizona v. United States (2012): "There is no reason Arizona cannot make it a state crime for a removable alien (or any illegal alien, for that matter) to remain present in Arizona. https://www.supremecourt.gov/opinions/11pdf/11-182b5e1.pdf"
"4/ US District Court Judge Andrew Hanen, 2015: "There is a certain segment of the population that finds the phrase ‘illegal alien’ offensive. The court uses this term because it is the term used by the Supreme Court in its latest pronouncement pertaining to this area of the law." 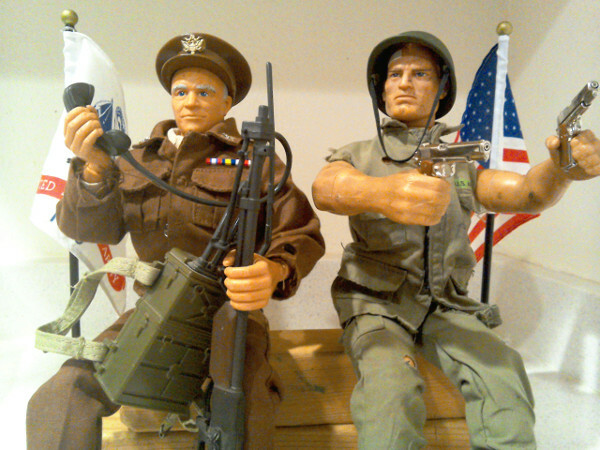 "We've reviewed your tweets and confirmed that it is ineligible to participate in the Twitter Ads program at this time based on our Hateful Content policy. Violating content includes, but is not limited to, that which is hate speech or advocacy against a protected group." 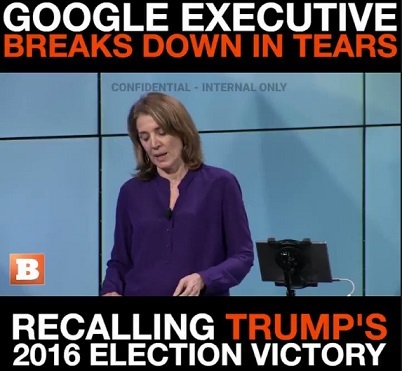 Google Leaked Video Shows Employee Snowflakes Melting Down After 2016 Election: Last but not least, Google the "biggest" of big tech, is reeling from a leaked video that Breitbart published showing Google employees, crying, group hugging and bemoaning the loss of their favored candidate, Hillary Clinton after the 2016 presidential election. Warning: Hour-long video, and many readers will need many breaks, especially after the pathetic "group hug" so everyone can feel better after seeing Clinton lose. They have ramped up all lines of attacks against Independent Media and conservative messaging to prevent open and free discussions online. Bottom line here is that if these tech companies and social media platforms are getting so blatant in their open censorship, something huge is coming because they feel the ramifications later are not as important as manipulating the upcoming midterm elections. In a radio interview with Hugh Hewitt, former Secretary of State John Kerry admitted that he’s been working behind-the-scenes to salvage the Iran nuclear deal. “What I have done is tried to elicit from him what Iran might be willing to do in order to change the dynamic in the Middle East for the better,” he explained. Kerry’s backchannel with Iranian Forei12.8KShare219TweetEmailgn Minister Mohammed Javad Zarif has not been a one-time deal. 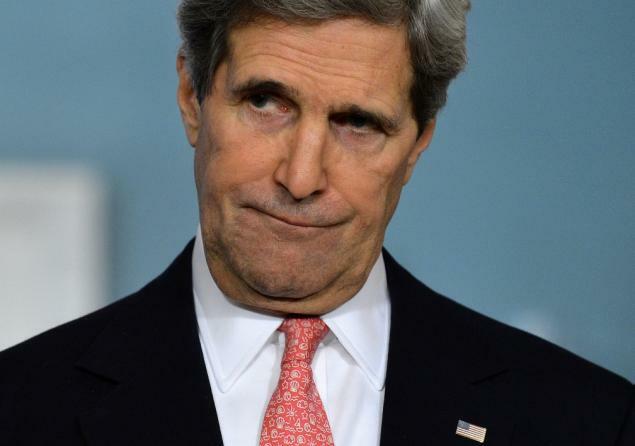 “I think I’ve seen him three or four times,” Kerry said, and acknowledged that his talks were occurring without the Trump administration’s approval.